Tamper & Co, I believe it was re-branded from the previous La’Coffee. 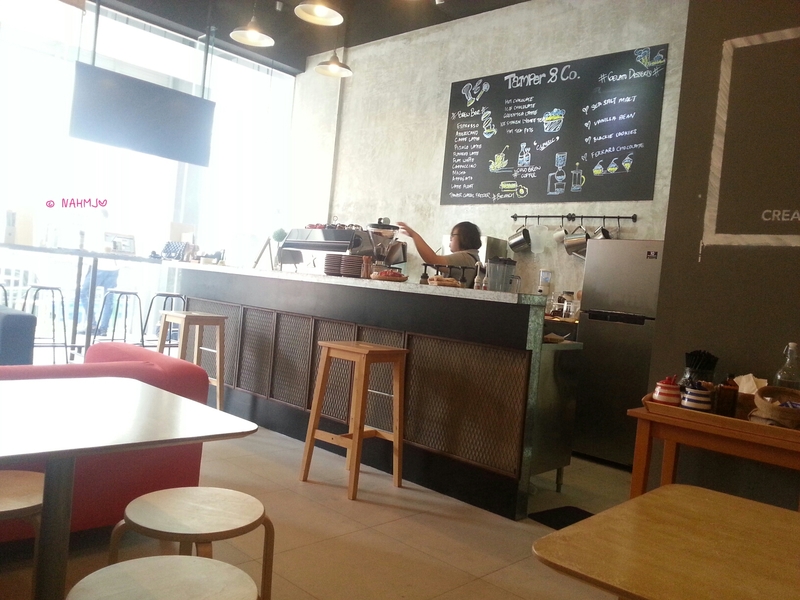 As I saw the same lady (I think she is the owner) also at Tamper & Co. 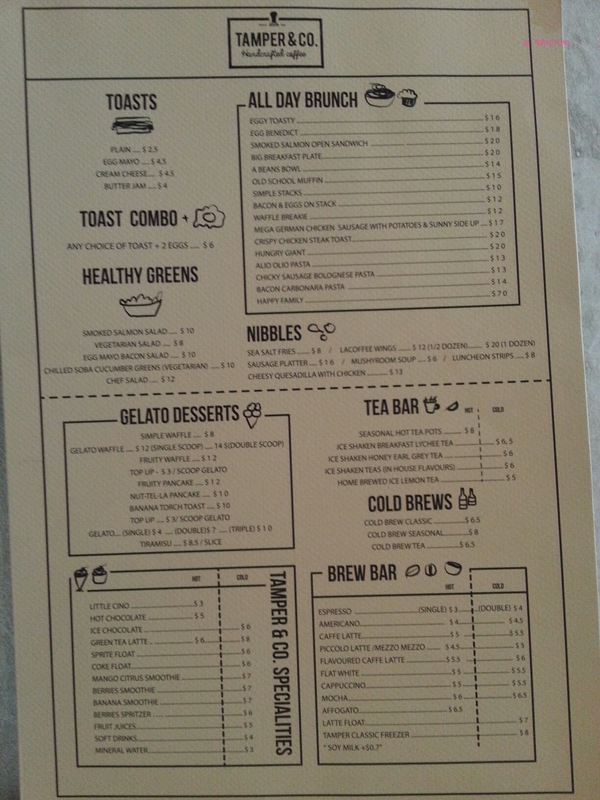 Moreover, I spotted the la’coffee chicken wings on Tamper & Co menu. When I entered the cafe, I thought it was a new cafe taken over la’cofffe which I previously blog about and wasn’t impressed. So when I notice that it was probably a re-branding, I was feeling a little peeve. Unfortunately, I discovered the traces only after I have placed my order. 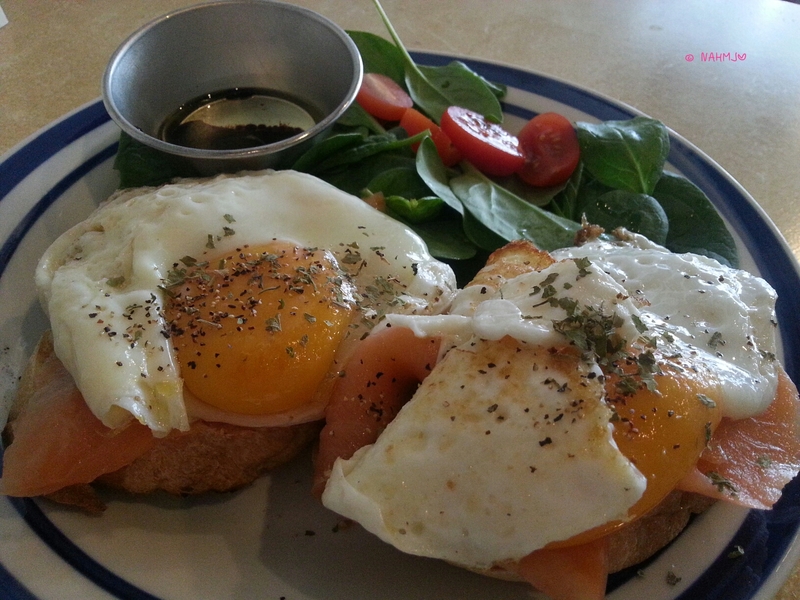 When I was served with two thin slices of baguette, some (though good amount) of Smoked Salmon, two Sunny Side-up (per my request) and a Spinach salad with simple Olive Oil mixed with Balsamic Vinegar dressing, my heart sank. For $20, I wasn’t impressed. 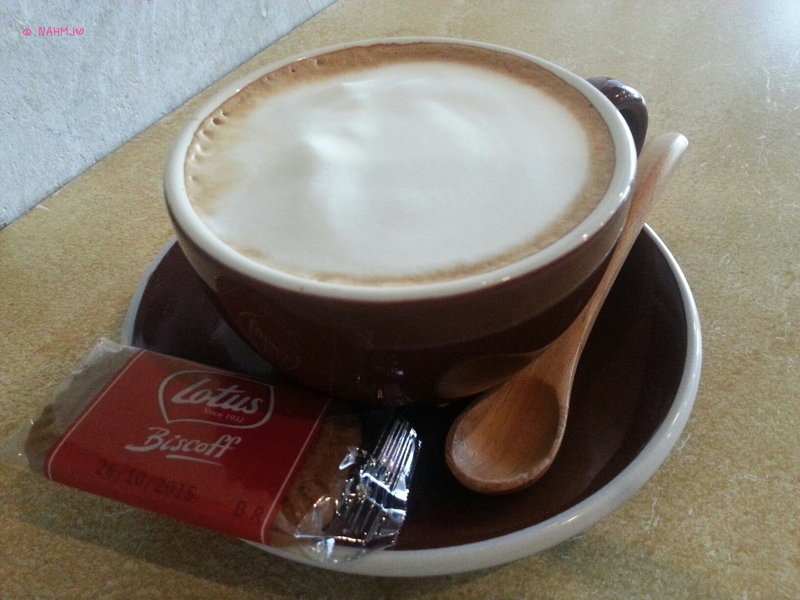 Next, my Cappuccino, there wasn’t any Latte Art. As I could pour a decent Tulip at my first and only attempt, after which whenever I don’t see a Latte Art on my cuppa, I some how will never feel satisfied with the coffee. The coffee was on par, certainly no where near good. The design was pretty much like la’coffee with only some re-arrangement and changes to the colour of the table top. If I am correct about it is a re-branding, I am surely disappointed as I don’t see much improvement to the execution of the cafe. It’s only a change from the highly priced traditional coffee to another highly price typical cafe food. The blogger is entitled to his/her own comments on whether the food is good or not. If the review elsewhere is good, it just mean that this review is not justified and the influence of this blog is naturally not credible. But if the review is accurate, it will also serve as a reference that the cafe has a significant improvement down the road near future. Thank you for your thoughts! Well said! wa lao if ur family owns businesses which shop ?? come i go see if ur food is good ? funny now a days ppl who have camera call themselves photographer , got access to blog call blogger . We don’t run food business. I am sure you are right. These are just terms that people come up with. Take it easy and have a good day. I am not sure how you are related to Tamper & Co but nonetheless don’t get too affected by my personal post as it is just an individual opinion. There might be people who are impress with Tamper & Co. This is one and only opinion out of the many hundreds, thousands or even millions out there. The one and only don’t have such a great effect to rock Tamper & Co.
Alternatively, take it positively, as a feedback to work on. For your information, I won’t be replying to more of your comments. Take care and I wish you and Tamper & Co well. its people like u that comment so much , so clever u open business la old hag. Thanks for your comment. FYI. In my family, we owe two businesses. I know it is tough to run business therefore I always believe in giving second or even third and forth chances. And I am not looking for excellency but improvement. And I certainly hope that Tamper & Co (the new brand) will start seeking customer feedback and work on them and I am sure they will do better. And I do wish Tamper & Co well. Even though I am disappointed, I will return for the next time and hope that it will impress me one day.